In my haste to post my painting yesterday so I could do easy, I forgot to mention the Nip & Bones' Furrz Mob Shop-A-Thon. They are now taking pre-orders for Silvervine pillows like the one I'm playing with in my hit videos here and here. In addition, here is my first close encounter of the Vine kind, thanks to King Spitty. You can order the pillows by clicking here. By the way, that's MY pillow in the pic. TW actually took a picture that's in focus! She claims its because the pillow wasn't moving and turning its head away like I do. Pfffttttt! They also come in flowery and plaid patterned material. Better get your orders in because the pillow are almost sold out. I was honored to DJ at a Fundraising Pawty on Twitter Caturday night. I even donated one of the paintings, which was won by @ChrisGroove1. Support Baby Patches and her peeps. I'm sorry if I haven't commented on all your blogs the past few days. I promise I'll stop by and visit everyone who's commented on my blog last week. I've already been to visit a few of you. Once baseball season begins, my blogging goes to hell in a hand basket (HUH????) because The Woman's priorities are all screwed up … and she calls ME bipolar. If any of you know what a hand basket is, please let me in on the joke. This little kitteh is NOT amused. My April calendar. Once again, TW is late getting the calendar out to my readers. Now you have some idea why I bite her. You might note that I have the 6th (New York Yankees' Opening Day) marked on the calendar. With the peeps being such big NYY fans, that's a holiday around here. When TW was young, the 25th was known as "Secretary's Day;" but there aren't anymore secretaries. One look at the help wanted ads tells you that. Maxwell: Dood. Save your energy for the Good Stuff when it arrives. Well not to worry CK, we know you are out there just waiting to visit! Hi there CK, I can be understanding with your Mom and baseball season. Our Mom used to be like that but we don't get the channels any more to watch it.Our Mom used to love to watch every day. Hope all of you have a super Monday. Yeah, I never understood the whole baseball thing. What fun can it be to bat around a cold hard ball? Ever try to pick up one of those rocks? It's not even filled with catnip. Oh oomans have some strange likes and dislikes. I could never understand the football thingy either. Seems silly to chase a ball around a field when there are so many other things to do outside - like sniff and whiff around the field. Baseball is rounders, yes? Austin is a rugby cat if truth be told!!! oooh, we missed the pawty, silly mom is always busy lately, grr. But she did place an order. She wishes she knew about the silvervine. Our kitties would love this, so next time we visit Nip & Bones we'll be sure to add it, as long as I get a bully stick! 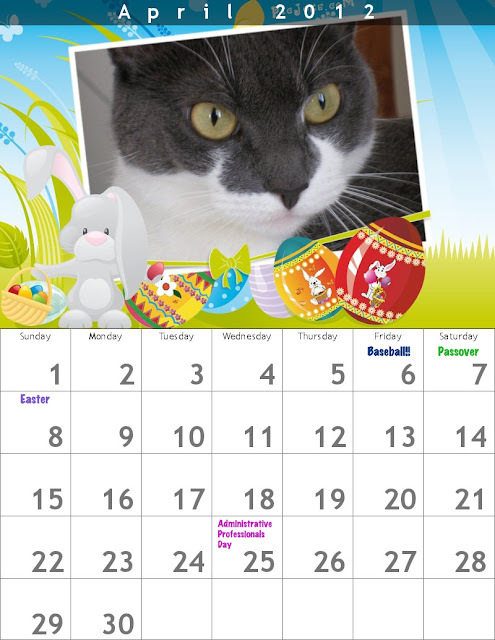 Love your April calendar picture CK! And your Easter blog header is so much fun, very cool! My human had better order that silvervine pillow - she has been dragging her feet on it! Pawsome post my furriend! Luvs your pawsome calendar too. I hopes you won't has to suffer too much because of that hard ball sport. Thanks you for posting about the Silvervine and our Furrz Mob! Sorry. We didn't really read anything after silvervine. HaHaMeow! We got a couple of those silvervine pillows from Bin all the way in Malaysia! They are awesome!! We're so glad Bsby Patches will be selling them now!! I just made Mommy order us a couple of those pillows! I made the Human buy me a plague ratsie, a Bird, and a VINE PILLOW. I am filled with happy anticipations!!! I know what you mean about the baseball. The Giants paid Matt Cain $112.5 million today, though, and that is making the Human crazy. It almost (not quite, but almost) makes her not want to watch a game anymore. *I* say she's just jealous.